In the footsteps of the classic Marshall Gov’ner this monster was born. Just like its big brother Charlie Brown, the Angry Charlie is versatile, well rounded and full of tone but one thing sets them apart. 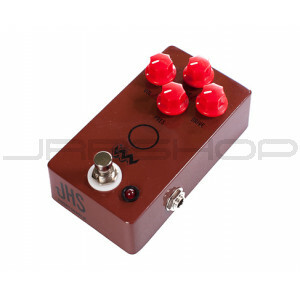 This ones a little more Angry… If you want high gain Marshall tones reminiscent of a JCM-800, than this is the pedal for you. The gain knob has an unbelievable range of overdrive to head-on heavy grind and the tone knob actually has a solid range unlike many distortions on the market. The additional presence knob adds a versatility and tweaking ability that transforms any amp into a fire breathing monster! Big classic distortion tones are what this box is all about. If you need a high gain but "realistic" sounding pedal than look no further!